진정한 성공의 역사는 독일 알프스 알고이(Allgäu) 지역에서 시작됩니다. 그리고 이 역사는 전세계에 걸쳐 계속 이어지고 있습니다. OTT-JAKOB은 고객의 요구사항을 중심으로 생각하고 행동하는 혁신적인 기업입니다. 저희는 이를 통해 항상 고객의 특수 요구사항을 만족시키는 효율적이고 실용적인 제품 개발을 보장합니다. OTT-JAKOB 제품은 저희 고객 기업의 지속가능한 성공 향상에 기여하기 위해 최선을 다하고 있습니다. 저희 직원은 자동 공구 체결 기술 분야에서 쌓은 백년간의 경험에서 나온 광범위한 지식 기반을 활용할 수 있습니다. 혁신적인 아이디어는 3D-CAD 작업실에서 최신 계산 소프트웨어의 도움으로 실행됩니다. OTT-JAKOB은 최첨단 생산 시설을 통한 전문적인 작업을 기본으로 삼고 있습니다. 선두적인 기계 및 스핀들 제조업체와의 수년간의 경험과 협력 그리고 다양한 대학교와의 지식교환은 저희 서비스 범위를 극대화시켜 줍니다. 저희는 지난 수십년 동안 이룬 선두적인 개발을 통해 현재 완전한 모듈 프로그램을 갖추었고, 이를 통해 이미 HSK와 스팁 테이퍼를 위한 수천가지 공구 체결 시스템을 성공적으로 제조하였습니다. 매일 새로운 체결 시스템을 개발하고 최고의 장비가 갖춰진 테스트 구역에서 철저히 검사합니다. 저희는 이를 통해 완벽한 자동 공구 체결 시스템 범위에서 글로벌 기준을 세웁니다. OTT-JAKOB은 광범위한 노하우를 갖춘 전세계 선두적인 체결 기술 제조업체입니다. 저희는 완전한 공구 체결 시스템의 제조업체로서 지능적인 모니터링 시스템의 개발과 통합에도 적극적으로 참여하면서, 자동 공구 체결 시스템의 차세대를 만들어 가고 있습니다. 이를 바탕으로 고객이 저희 고품질 제품의 사용하여 지속적인 성공을 이룰 수 있도록 지원하고 있습니다. OTT-JAKOB은 1993년 이래 6개사 중기업 연합으로 이루어진 JAKOB 그룹의 일원입니다. JAKOB 그룹에 대한 정보는 해당 홈페이지에서 찾아보실 수 있습니다. OTT-JAKOB사의 역사는 알베르트 오트(Albert Ott)가 독일 켐튼에서 기계 수리 기관을 설립한 1873년으로 되돌아갑니다. 알베르트 오트는 1880년 오스트레일리아의 멜버른 그리고 1893년 시카고에서 열린 세계 엑스포에 참가하여 시대에 앞서 글로벌 시장으로의 연결이 지속가능한 성장의 중요 핵심요소가 될 것임을 증명하였습니다. 1974년 최초의 자동 공구 교환 드로바를 개발하며 그 성공의 역사는 지금까지 계속 이어지고 있습니다. OTT-JAKOB은 “매일 알고이에서 최첨단 기술”을 인도하는 것을 목표로 삼고 있습니다. 여기에는 저희 고객의 요구사항에 맞추기 위해 언제나 고품질의 최고 기술 제품을 생산하려는 노력이 담겨 있습니다. 저희는 기업정책의 일환으로 다음과 같은 품질보증 규칙을 지키고 있습니다. 실용적인 내부 규정에 따른 라인의 100% 최종검사를 통해 높은 공급품질을 보장합니다. 품질 기준은 저희의 고객이 정합니다. 품질은 문의, 견적, 의뢰뿐 아니라 정확하고 기한에 맞춘 작업도 의미합니다. 품질, 납품기간준수와 경쟁력이 저희가 지키려는 기준이 됩니다. 모든 직원은 OTT-JAKOB에서 품질 목표를 지킬 것에 책임을 지고 있으며 모든 작업과정을 정확히 수행하는데 열정을 가지고 있습니다. 이를 통해 비용을 줄이고 품질을 향상시킵니다. 모든 직원은 지속적인 프로세스 개선과 품질 최적화를 위해 교육을 받고 있습니다. 저희 제품의 높은 품질을 보장하기 위해 저희는 저희 공급업체에게 높은 품질을 요구하고 있습니다. 이에 저희는 각 품질 기준을 충족시키기 위해 지원을 아끼지 않고 있습니다. 법적 규정, 규칙과 해당 유효한 기준을 당연한 준수사항으로 여기고 있습니다. 환경관리에는 다음과 같은 규칙이 바탕이 됩니다. 저희는 제품 개발과 생산에 있어 책임감과 원자재를 보존하는 의무가 있습니다. 환경 보호에 대한 법률, 규정과 고객의 요구사항을 준수하는 것을 저희 행동의 근본으로 삼고 있습니다. 저희는 환경보호와 안전 작업을 지속적으로 개선하고 있습니다. Regular checks of the tool pull force are essential, because the machining quality is fixed as soon as the tool is pulled into the spindle taper. If the clamping force required for this is insufficient, vibrations are likely to occur, which in turn will result in chatter marks on the surface of the workpiece. With the Power-Check Magazine, OTT-JAKOB highlighted a high-precision testing device for checking the clamping force condition at its booth. Designed for permanent use in the tool magazine, the Power-Check Magazine has a gripper groove and a long-term battery, which enables a mains-independent operation for up to 30,000 measurements. Thanks to a self-activation mechanism, the measurement starts automatically during the exchanging process. The Power-Check Magazine is available for all common sizes and variants of the interfaces SK, HSK, PSC and KM (KennametalTM). For data acquisition there are three options to choose from: the Power Monitor with a display, the USB radio stick to transmit the values to a PC and the RS485 bus antenna for data transfer to the machine control system. The latter offers special advantages with regard to data output. Since this is an in-house development of OTT-JAKOB, it is possible to integrate interfaces for an analog and/or digital output. 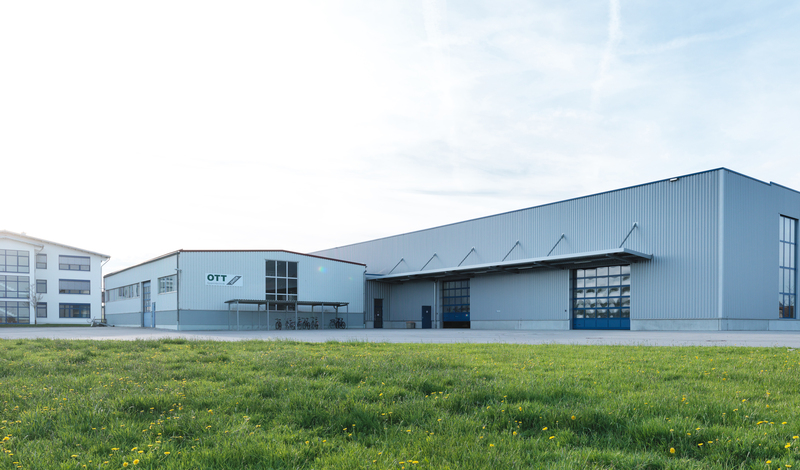 March 1, 2018 marked the 25th anniversary of the founding of OTT-JAKOB. On the occasion of this event, the company held a major anniversary celebration on September 14 and 16. Employees and former staff celebrated together with their families at the company headquarters in Lengenwang under the motto “When passion turns into performance”. The celebrations began on Friday with a festive evening. After being welcomed by company founder Ludwig Jakob and managing director Frank Jakob, the more than 200 employees were surprised by a diverse supporting programme of show acts, hands-on activities and live music. On Sunday the employees´ families were also invited to join the celebrations. On this day, the company grounds were transformed into a small amusement park with numerous attractions. In addition, the doors were open for a factory tour so that the families could take a look behind the scenes of the technology company. The origins of OTT-JAKOB Spanntechnik GmbH go back to the Institute of Mathematics and Mechanics A. Ott, founded in 1873 in Kempten, which initially specialised in the manufacture of mathematical and hydrometric instruments. The product range was constantly developed further and extended to tool clamping systems in the 1970s. The clamping technology division was spun off 25 years ago and since then has operated as an independent company under the name OTT-JAKOB. From September 10 to 15, the 32nd IMTS, the largest trade show for manufacturing technology in North America, will take place in Chicago. In the run-up to this year’s edition, the organisers arranged the IMTS Exhibitor Product Innovation Competition to recognise the most innovative exhibits. The winners were announced at the beginning of August. OTT-JAKOB took second place with the Power-Check Magazine pull force measuring device. Numerous exhibitors had applied for the prize with their developments. A jury consisting of members of the Association for Manufacturing Technology (AMT) chose the three most innovative solutions. The entries were evaluated according to technical and economic criteria, including degree of technological innovation, cost efficiency and benefits for the industry, environment and society. Designed for fully automated use in the tool magazine, Power-Check Magazine is predestined for integration in a Smart Factory environment. 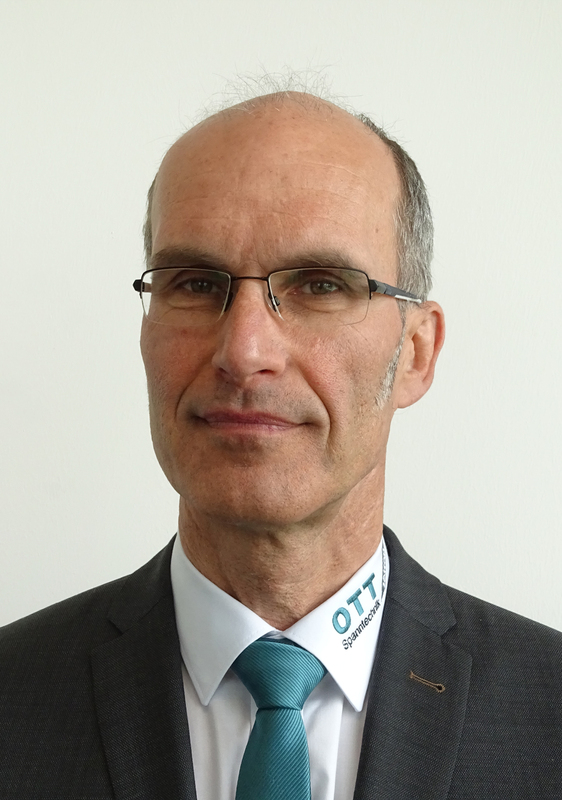 “The OTT-JAKOB Power-Check Magazine is a major step towards the implementation of Industry 4.0 in the field of production and helps to achieve highest quality standards.”, says Josef Greif, R & D Director at OTT-JAKOB. Click here to watch the interview with IMTS TV. The time has come for the market launch of the turret interface pti (polygonal turning interface) with the first size pti65. The REKUNORM project answers the last open questions in the development of pti. 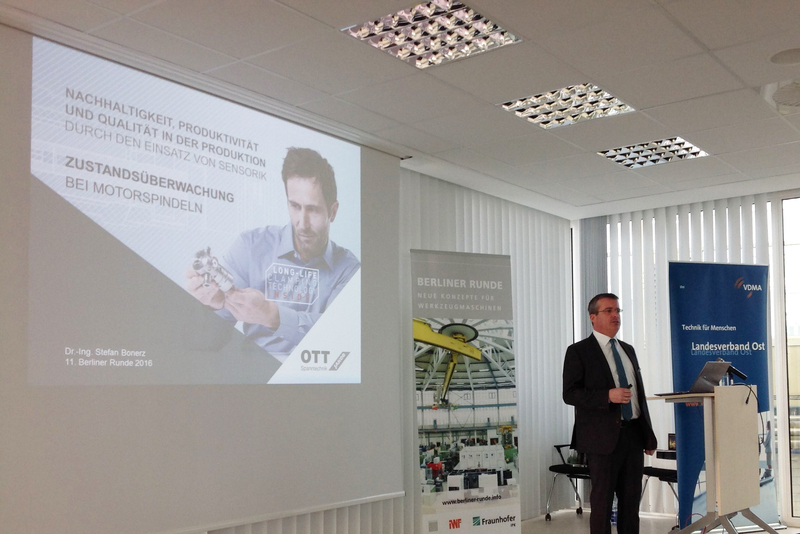 On May 8, about 50 experts met for an information event in Lengenwang at the headquarters of the clamping technology specialist OTT-JAKOB. The REKUNORM project group, chaired by Dr. Dietrich Lembke, chairman of the DIN standards committee, presented the current state of development of the project. The main objectives of REKUNORM are the development of a uniform coupling for driven tools and the development of a standard proposal for shank, holder and coupling. While work on the coupling is still in progress, the two main parts of the future standard (shaft and holder) can already be submitted as a draft standard in October 2018 due to the advanced development work. The project partners pursue independent development tasks in their respective fields and transfer the results into a joint standard proposal. The REKUNORM Group, consisting of OTT-JAKOB, the revolver manufacturer Sauter, the tool holder manufacturer WTO and the lathe manufacturer Weisser as well as the WZL of RWTH Aachen also presented the progress of the individual sub-projects in Lengenwang. The result is a tool interface with a planar system and an octagonal conical polygon shank (pti). After a first development project (REVOSIT) has already laid the foundations for the pti65 size, this has now been completed within the framework of a series and completed with pti54 and pti42 by two further sizes. The objective of OTT-JAKOB is the development and production of a turret clamping system for quick change of tool holders with polygonal shank. With the introduced powerful pti clamping system, essential prerequisites have been created for the pti interface to find its way into industry. 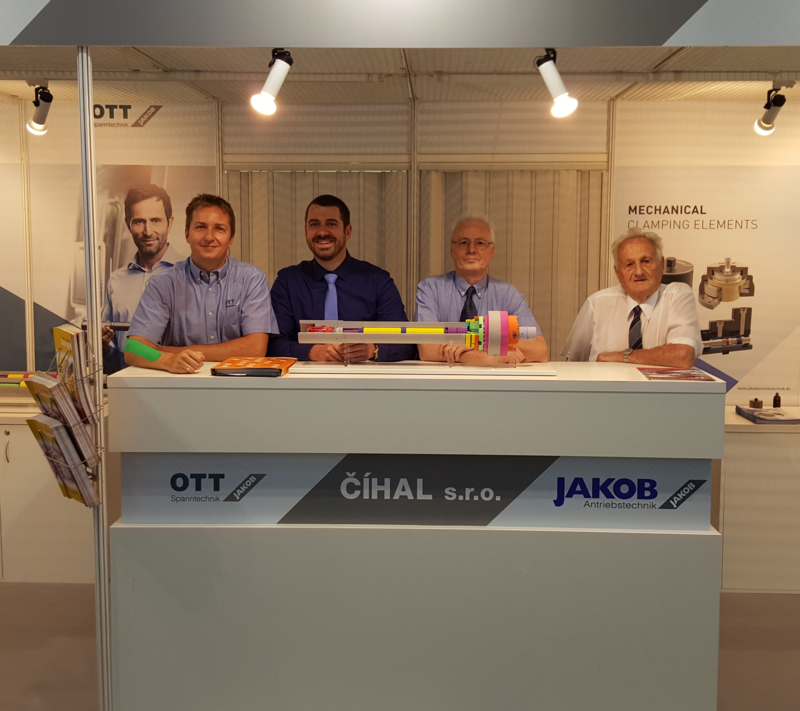 The tool clamping system manufacturer OTT-JAKOB celebrates its 25th anniversary in 2018. On March 1,1993, the tool clamping technology division of OTT-Maschinentechnik was spun off and integrated into the JAKOB Group by the father of today’s managing director Frank Jakob as an independent company under the name of OTT-JAKOB Spanntechnik. 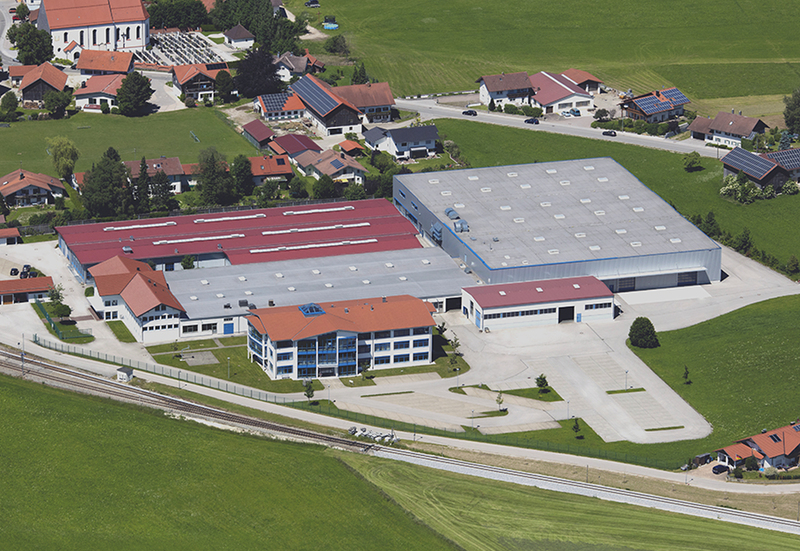 The roots of the family-owned company, which is located in the Allgäu region, go back to 1873, when Albert Ott founded an institute of mathematics and mechanics. The original core business was the production of mathematical and hydrometric instruments. The company entered the mechanical engineering sector in 1948 with the production of cross-winding machines for the textile industry. In the early 1970s, the mechanical engineering sector was expanded to include machine tool technology and the company began producing tool changers and clamping systems. Today, OTT-JAKOB focuses exclusively on the development and manufacture of tool clamping systems and mechatronic monitoring solutions for machine tools and is one of the key players in this market worldwide. On 18 September, during the world’s leading metalworking exhibition EMO, the German MM MaschinenMarkt magazine has granted the MM Award for the sixth time. With the prize the magazine honoured the industry’s most innovative exhibits. In the category “clamping devices” JAKOB Antriebstechnik GmbH, a JAKOB Group company, was able to persuade the judges with its digital clamping force device “Force Monitoring System PAD” and take home the prize. The award is also an acknowledgement of the innovativeness of JAKOB’s affiliated company OTT-JAKOB. As project partner, the tool clamping technology manufacturer has been decisively involved in engineering FMS PAD by developing the entire electronics for the novel monitoring system. The company was able to apply its many years of experiences in R&D projects in the field of sensor based monitoring technologies and transfer its know-how from tool clamping technology to workpiece clamping technology. FMS PAD monitors the clamping force during all operating states at large machine tools and is an important step towards a connected production environment. “The award confirms that we are on the success track in terms of the Industry 4.0 machine tool with our new development”, said Dr. Arno Wörn, head of development at JAKOB Antriebstechnik. 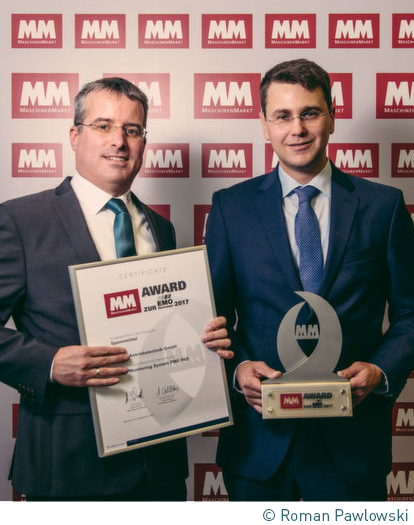 Together with Dr. Stefan Bonerz, technology manager at OTT-JAKOB Spanntechnik, Mr. Wörn accepted the MM Award in Hanover. OTT-JAKOB expands its range of services by adding a download center to its website. 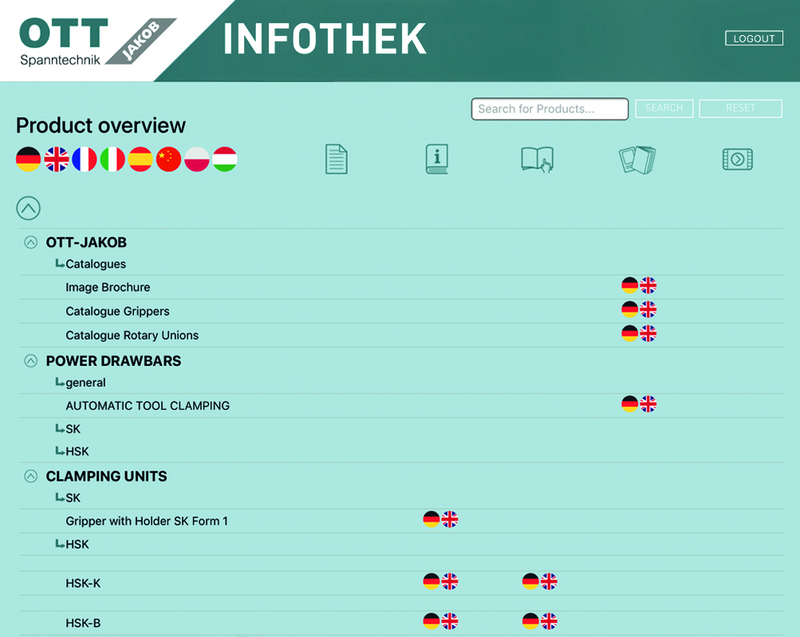 The Infothek is an information portal for customers offering free access to all important documents relating to OTT-JAKOB products. More than 400 files are available for download, among them data sheets, instructions, videos and software. The majority of the files are in German and English. Selected documents are also available in other languages. All materials are neatly grouped into categories. 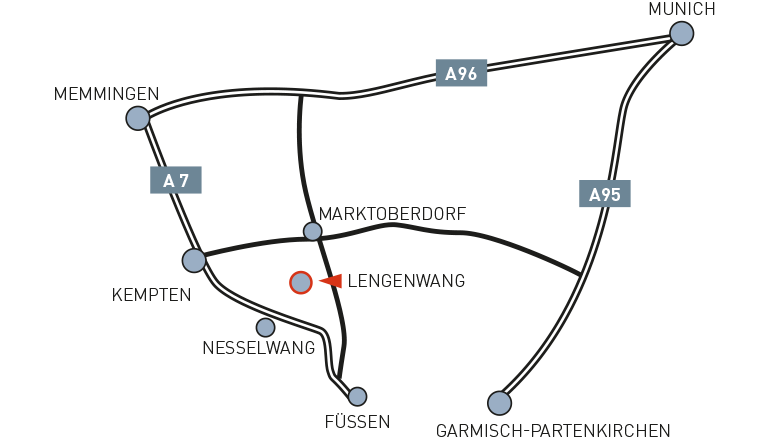 An integrated search tool allows to search the Infothek by individual terms. 1. Start registration process by clicking on LOGIN on the homepage. 2. Then click on NEW? REGISTER NOW. 3. Fill in the fields and confirm registration by clicking on REGISTER NOW. 4. Within two working days, you will receive an email containing a password. 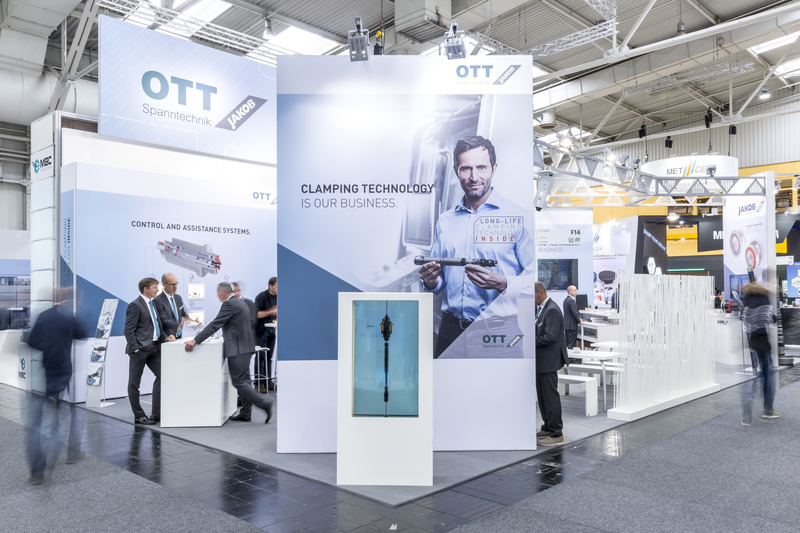 With their multi-sensor unclamping unit, OTT-JAKOB showcased the latest addition to their portfolio in sensor-based assistance systems at the EMO Hanover. The sensor system introduced as MSU is an innovative Plug & Play Monitoring solution that groups up to three control functions into one unit: monitoring of the position of the drawbar shaft, detection of the position of the release piston and optimum leakage detection. MSU can be integrated into virtually all OTT-JAKOB unclamp units and be adapted to special solutions. In the field of manual clamping technology OTT-JAKOB informed about the new research project REKUNORM which was launched for the EMO. REKUNORM is the follow-up project to REVOSIT, from which the standardised pti turret interface (polygonal turning interface) arose. 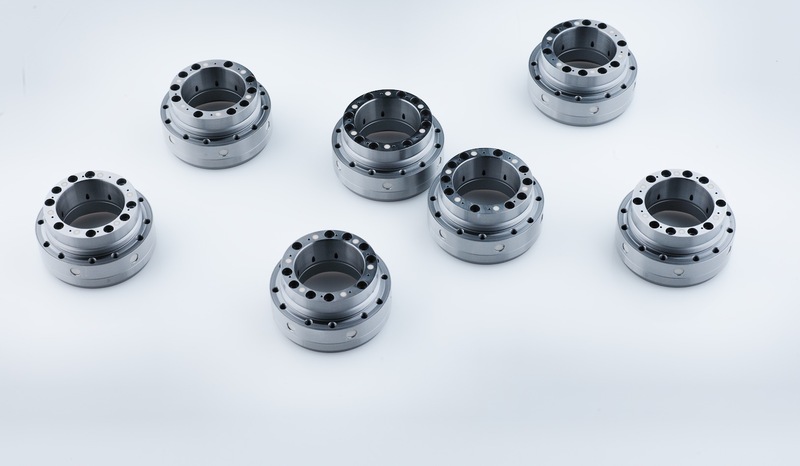 As a result of the existing diversity of couplings on the market, the main objective of REKUNORM is to develop a standardised coupling for driven tools in turret lathes. The Power-Check 2 pull-in-force measurement device has been design-optimised thanks to a number of further developments. Among the most important measures is the changed locking function of the adjusting sleeve that now operates without bores on the plane surface; this, in turn, enabled additional implementation of sealing of the sleeve and the force sensor. Due to the changes made, OTT-JAKOB has laid the foundations for achieving the IP67 protection class, which is, among other things, equivalent to protection against penetration of water when temporarily immersed. The new OTT-JAKOB product catalogue offers comprehensive information on automatic tool clamping and serves as a tool for design engineers to plan their projects and configure a clamping system. On 166 pages, OTT-JAKOB presents a selection of its wide range of products and as an expert in individual solutions, focuses on components for the most common applications. Following the modular setup of the clamping systems, the product section is structured into four main chapters: grippers, pulling heads, unclamping units and rotary unions. This is rounded off by selected reference clamping systems with corresponding sample applications and accessories. The catalogue contains detailed technical specifications and order information, as well as dimension drawings. Tables provide an extensive overview of the wide range of products. An easy to grasp colour coding system ensures quick orientation. For the new edition of its catalogue, OTT-JAKOB has also developed a concept which gradually guides customers to the individual order code of their desired configuration. The new OTT-JAKOB catalogue is available in German and English. On 1 June 2017, a change at the top of the OTT-JAKOB sales department will take place. The long-time Sales Director Hubert Sykora will retire after 47 years with the company. He will be followed by Hans Leidl. 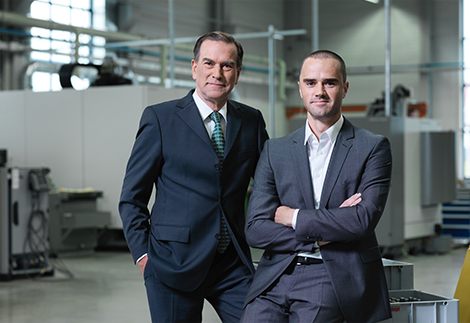 With Leidl, the clamping technology specialist was able to acquire an experienced manager within the company’s own ranks as successor to Sykora. Having worked at OTT-JAKOB for 20 years, Leidl possesses in-depth knowledge of the company and industry. Since 1997 he has led the service team within the sales department and already has built a reputation among customers as a reliable and competent contact person. From his new position, Hans Leidl will manage all global sales and service activities and report directly to the Managing Director. In the course of the personnel changes, the long-time sales representative Roland Theurer was appointed Deputy Head of Sales. Alexander Heupel, previous Deputy Head of Service, takes over the role of Head of Service. As an internationally operating company, OTT-JAKOB has built a network of qualified specialists over the years in order to ensure reliable service and optimal support on site. With Fischer Spindle Technology, the Allgäu based company managed to acquire another strong partner for the Russian market. Located in Novosibirsk, Fischer Spindle Technology is a subsidiary of the Swiss spindle manufacturer Fischer AG, a long-time customer of OTT-JAKOB. 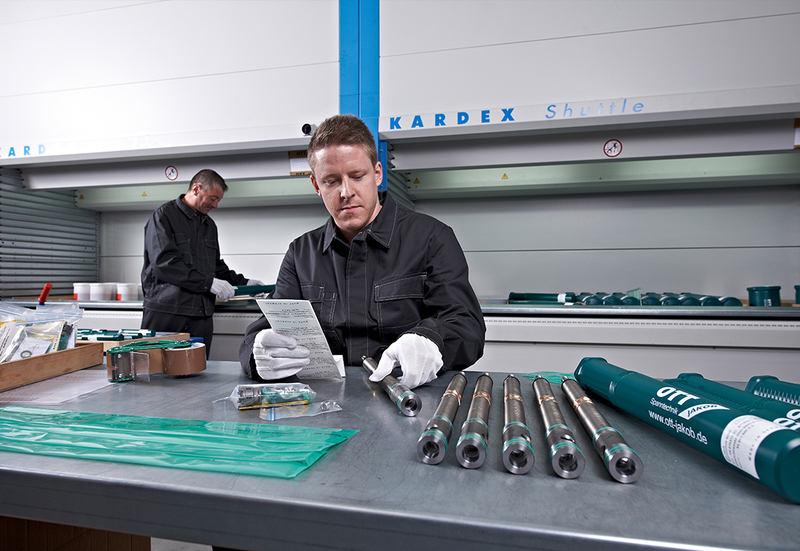 The Siberian location was founded in 2010 as spindle service center of the Fischer Spindle Group AG. Hubert Sykora (Sales Director) and Hans Leidl (Head of Service) have laid the foundation for the future cooperation with a trip to Novosibirsk. 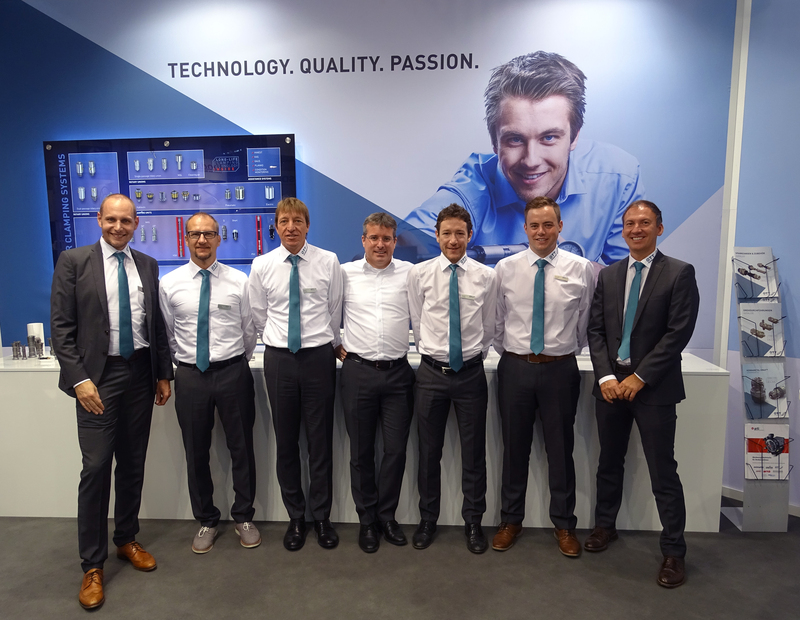 With an extensive training, Fischer Spindle Technology got prepared intensely for its upcoming tasks as a representation of OTT-JAKOB. In addition to the existing contacts, Fischer Spindle Technology will be available from 1 January 2017 to advise Russian customers and prospects on the OTT-JAKOB product range. 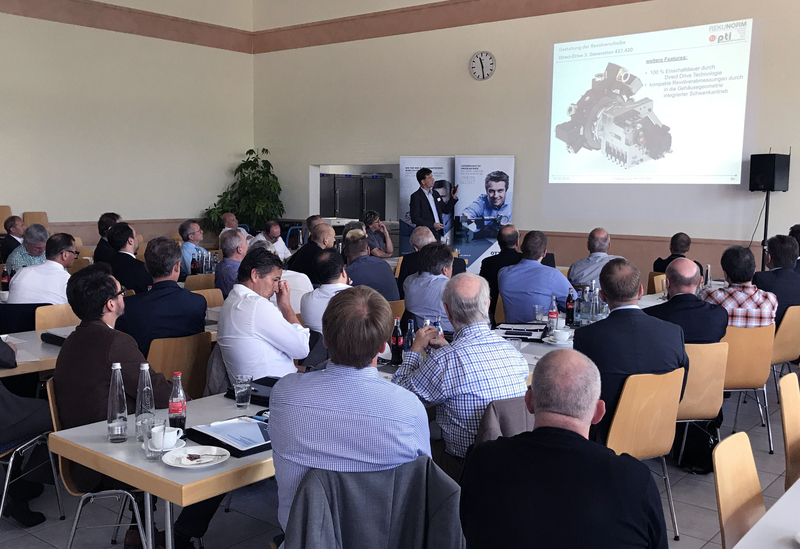 In November, GF Machining Solutions, a division of the Swiss Georg Fischer Group, invited selected suppliers to the Supplier Day 2016 in Losone (CH). During the event, the company honoured its ten best suppliers in Europe. The regularly conducted evaluation is based on a fixed catalogue of criteria, such as quality, innovation and adherence to schedules. OTT-JAKOB has succeeded outstandingly in meeting its customer´s requirements with its overall performance and was awarded “Top 10 Supplier 2016” in Losone. 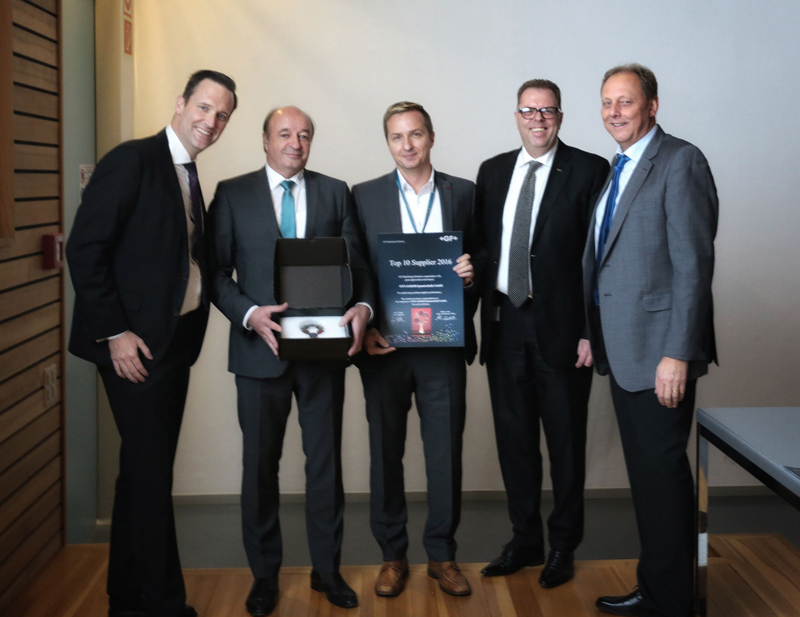 The prize was accepted by Sales Director Hubert Sykora and Markus Homanner (Technical Sales). “The award is the result of the dedicated efforts of all employees at OTT-JAKOB and confirms that we deliver the highest level of workmanship. We not only view this award as recognition, but as motivation to expand the successful cooperation and our position as preferred partner.”, said Sykora. 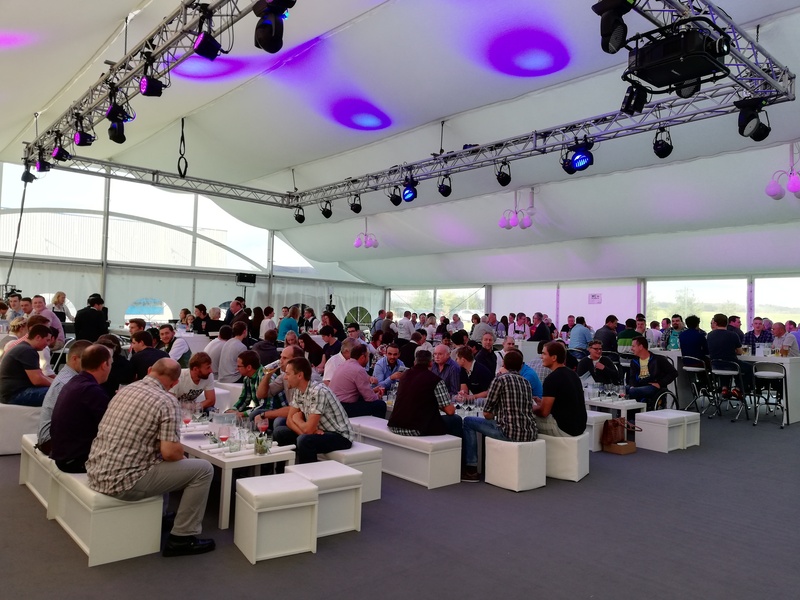 In September, OTT-JAKOB presented itself at two top-class events and had the chance to showcase its product solutions to an international audience. 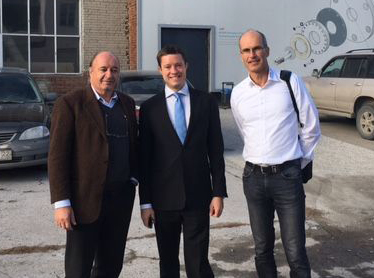 At IMTS in Chicago and AMB in Stuttgart, the company informed about its portfolio of products and services. The “International exhibition for metal working” (AMB) ranks among the world’s leading exhibitions in the mechanical engineering industry. Around 90,000 visitors came to Stuttgart to catch up on the latest market trends. At the OTT-JAKOB booth everything revolved around automatic complete systems, manual clamping technology and intelligent condition monitoring technologies. Besides a selection of the current product range, exhibits included a number of new innovations and further developments. This year’s AMB highlights were a clamping system equipped with a FRP spring, as well as the rotary union 2K-GDSD-CO2, which has been specifically designed for cryogenic machining. Furthermore, OTT-JAKOB introduced a complete system solution for the high-performance interface KM4XTM. At the IMTS in Chicago, OTT-JAKOB was represented by its long-term partner AME, which is celebrating its 50th anniversary this year. With about 2,000 exhibitors and more than 100,000 visitors, IMTS once more confirmed its status as the largest manufacturing technology trade show in North America. For the eleventh time, the Institute for Machine Tools and Factory Management hosted the machine tool congress “Berliner Runde”. Around one hundred representatives from industry and science met for knowledge exchange on 3 and 4 March at the Berlin Center for Production Technology. Participants had the chance to attend a top-class event featuring presentations by renowned speakers of the machine tools industry as well as a parallel held exhibition. Current and future developments in machine tool construction were presented on this year’s key topic “Sustainability, productivity and quality in the production through utilisation of sensors and actuators”. 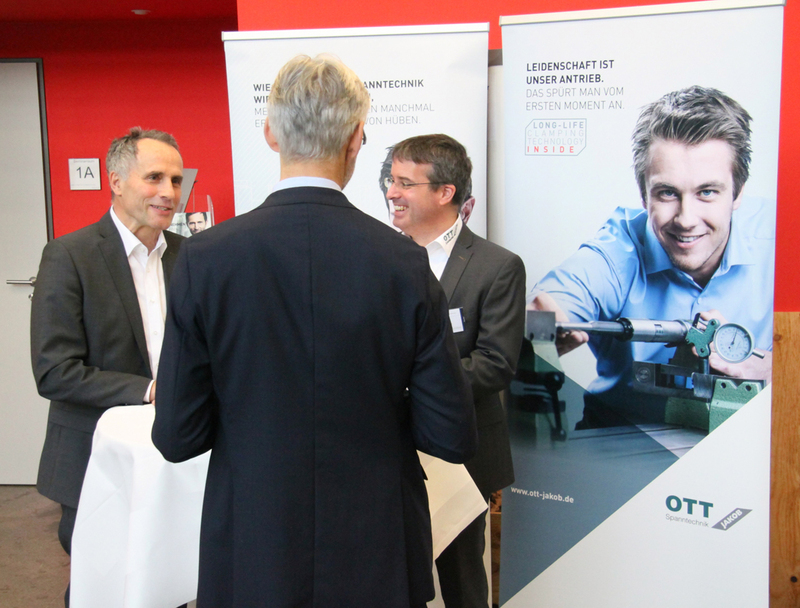 OTT-JAKOB participated at the two-day event with a presentation on “Condition monitoring in motor spindles”. Technology Manager Dr Stefan Bonerz discussed how the use of sensor based monitoring systems helps to identify failure potential of clamping systems components early. Information on the complete product range of OTT-JAKOB was provided at the exhibition booth. On 18 and 19 November, the 15th Machining Innovations Conference for Aerospace Industry (MIC) took place at the Hanover Centre for Production Technology. MIC is an internationally valued forum with more than 200 experts from science and industry participating each year. The conference was hosted by the Machining Innovations Network e. V. in cooperation with the Institute of Production Engineering and Machine Tools. Focus of the event have been presentations by speakers of renowned companies about current trends, experiences and research results on “Production technologies in aerospace Industry”. Dr. Stefan Bonerz, Technology Manager at OTT-JAKOB Spanntechnik GmbH, discussed the flush fitting control in his speech with the title “Monitoring the quality of tool clamping in the tool interface”. 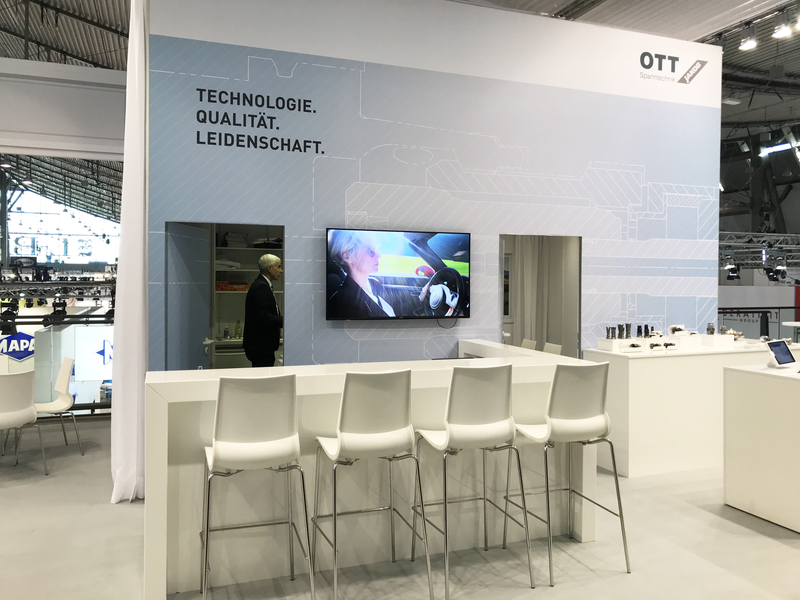 At the booth of the parallel running exhibition, visitors had the opportunity to learn more about the OTT-JAKOB product range. Since 2010, OTT-JAKOB has been on YouTube with an own channel. After an extensive rebranding in July 2015, the company launched a new channel to adapt its YouTube appearance to the new corporate identity. The new channel replaces the former one and serves as an information platform for customers and prospects. The recently created image film and a product video provide insight into the company and its portfolio. In future, product specific and user-oriented videos will follow. 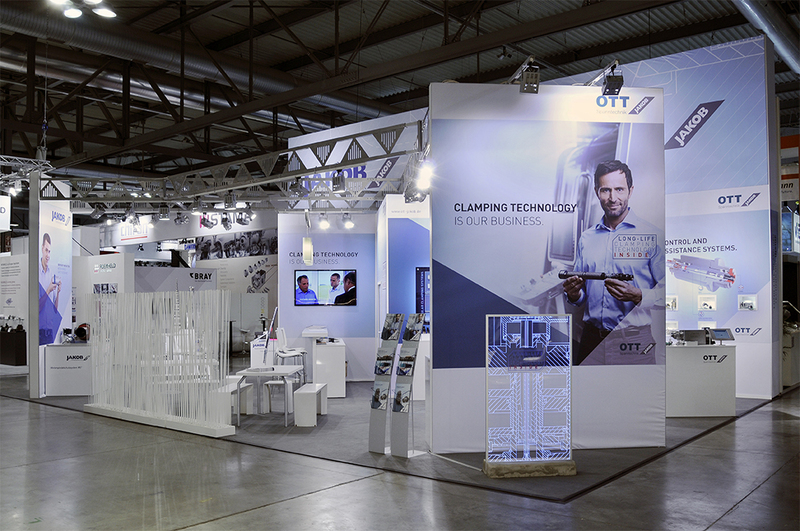 The grand final of OTT-JAKOB´s exhibition year was the participation at the 2015 edition of the EMO in Milan, Italy. “Let’s build the future” was this year’s motto of the world’s leading metalworking fair, which attracted more than 155,000 visitors. OTT-JAKOB featured at its booth solutions for automatic and manual tool clamping as well as for Industry 4.0. 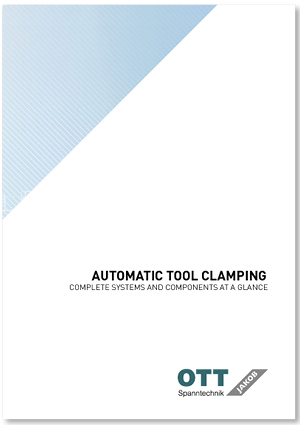 As a manufacturer of complete, automatic tool clamping units, the company placed special emphasis on the modularity of its clamping systems. The unique setup allows the combination of standard components with costumer-specific elements. Exhibits included the well-established interfaces SK, HSK and PSC (Coromant CAPTOTM), as well as the high performance interface KM4XTM, which was developed in exclusive collaboration with Kennametal. The manual clamping units of the series QCS for HSK and CTC / SVC for PSC have been on display, too. In the field of the current industry’s key topic “Industrie 4.0”, OTT-JAKOB was showcasing its portfolio of assistance systems. With the development of intelligent monitoring technologies, the clamping technology specialist once again demonstrates its innovativeness. The product line built around the tool pull force device Power-Check 2 and the flange surface monitoring system PLANKO have been given special prominence at the booth. The EMO was also the first public event, where OTT-JAKOB presented its new brand identity. After an extensive makeover, the company re-introduced the brand in July and uses the new visual appearance in all media since. 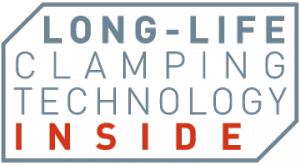 The new slogan “Long-life Clamping Technology” concisely summarizes the essence of the brand. From 14 to 18 September, the engineering fair MSV took place in Brno (Czech Republic). The 57th edition of the leading industrial fair in Central Europe offered its more than 1,500 exhibitors once again an ideal platform to present their products to the international engineering industry. At the joint booth with JAKOB Antriebstechnik, OTT-JAKOB and its Czech representative Číhal s.r.o. displayed a selection of tool clamping solutions. The company focused on its core competencies with exhibits from its automatic and manual tool clamping range. Over the duration of the trade fair, the OTT-JAKOB booth was continuously well frequented. The mainly Czech visitors showed great interest in the modular set up of OTT-JAKOB clamping systems and the numerous configuration possibilities. Moreover, there has been noticed an increased demand for rotary unions. As in previous years, the high density of top-class exhibitors resulted in excellent visitor attendance. Particularly positive about the 2015 edition of the MSV was the large number of end-users visiting the event. To ensure a high level of process reliability in machining, high-resolution sensors are necessary for monitoring the flange surface of the tool during rotation. These distance measurement sensors face a diverse and demanding range of requirements. At EMO 2011, OTT-JAKOB presented its brand-new flange surface monitoring solution (working title ‘PLANKO’) based on ceramic resonators and waveguide structures which, in combination with radar electronic components, make it possible to precisely and reliably measure distances from 10 µm at turning speeds of up to 15,000 rpm. This solution was further optimised in coordination with selected spindle and machine tool manufacturers. In the new sensor structure, the sensor path in the transition area is now replaced by a cable between the radial and axial holes. The critical machining dimensions of the deep, circular waveguides are consequently not necessary. The assembly process is also made easier, and the flexibility for various tool interfaces is ensured. The resonator is reduced to a minimum length and forms a compact electronics module with the cable and the connector, which fits perfectly into the prefabricated installation hole. The rotor signal is coupled by means of an antenna, while the other high-functioning electronics have been further miniaturised and can be integrated around the spindle nose. There is more to OTT-JAKOB than meets the eye. Now and in the future. The technology leader OTT-JAKOB will demonstrate this from now on with its own technology label. Innovative technologies which go far beyond mere clamping systems and which guarantee maximum safety and precision in the long term. Top quality – this goes not only for our own products, but also for the machining process of the machine tool and its end product. Maximum passion – during development, over the entire life cycles of our products and in personal service for years to come. CIMT – China International Machine Tool Show – is one of the world’s largest and most influential machine tool exhibitions. From 15 to 20 April 150,000 visitors are expected at the China International Exhibition Center in Beijing. At the booth of SCH Group, visitors can find out more about the product range of OTT-JAKOB. EMO – the world’s leading metalworking fair – will take place in Hanover under the motto ‘Smart technologies driving tomorrow’s production’. Companies from around the world will present product solutions for machine tool technology at the Hanover Exhibition Grounds. OTT-JAKOB will present selected manual and automatic clamping technology highlights as well as assistance systems designed to be ready for Industry 4.0.